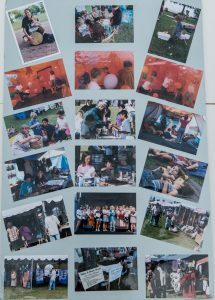 A record crowd of approximately 12,000 attended the 1998 CKCU Ottawa Folk Festival, held August 28-30 atBritannia Park. Despite intermittent downpours, rainbows appeared more than once in the festival skies, much to the delight of the participants. One of the festival highlights was a performance by folk veteran Arlo Guthrie, who played to an enthusiastic crowd on Sunday evening. Ferron received a warm response when she was awarded with the Helen Verger Award. The crowds were also dazzled by artists such as Americans Martin Sexton and Vance Gilbert. Chopper McKinnon and Karen Flanagan McCarthy returned to host the main stage throughout the festival. The highest number of performers to date participated in this year’s festival, showcasing a wide spectrum ofstyles. 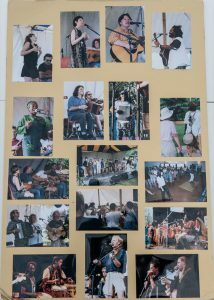 Traditional roots music was represented by acclaimed artists such as David Essig; Bourque, Bernard et Lepage; Gail Gavan and Cindy Thompson. Exciting musical hybrids such as the African-inspired ensemblesCheza and the Sifa Choir, the French/Cajun performer Danielle Martineau, blues crooner Georgette Fry, and the unique Celtic/klezmer/blues-influenced band, Night Sun, kept the crowd dancing. Canadian festival veteransRoy Forbes, Connie Kaldor, Moxy Früvous, Fred Eaglesmith, the Wyrd Sisters and Holmes Hookerounded out the evening’s lineup. 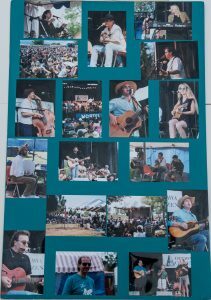 “If anyone wondered about the future of acoustic and folk-style music they only needed to take in last night’s opening set of concerts at the Ottawa Folk Festival to see that there’s a bevy of new artists already taking up the torch,” reported Rick Overall in the Ottawa Sun. The fun began on Friday evening on the Nortel Stage in traditional festival fashion, with Ottawa Folklore Centre owner Arthur McGregor performing an instrumentalguitar version of “O Canada”. Eclectic singer-songwriter Christine Graves was followed by Oh Susanna, a Vancouver native who puts a new spin on traditional North American country music. The wonderful and wittyVance Gilbert wowed the crowd with his awesome vocal style and accomplished guitar playing. Many considered his dynamic performance one of the most memorable at the festival. The Mike Plume Banddelivered a spirited plugged-in set that reflected the band’s alternative and country roots. Following intermission, crowd-pleasers Moxy Früvous had the crowd in stitches during their lively performance featuring their recent hits. The mood shifted to the gentle acoustic sounds of Seattle-based Erin Corday. Fred Eaglesmith was accompanied by his stellar band including Willie P. Bennett and Washboard Hank. The evening ended on a high note with an infectious and highly danceable set by the irrepressible band Night Sunfeaturing husband and wife Chris Coleman and Ellen Hamilton. There was plenty of daytime entertainment at this year’s festival, giving festival goers many opportunities to enjoy intimate performances. The Nortel Stage kicked off the afternoon with The Old Sod, music from Great Britain and France, featuring Finest Kind, Erin Cassidy, Bobby Watt, Aengus Finnan, and Bourque, Bernard et Lepage. Christmas in August, hosted by Shelley Posen, was a collection of the songs you would expect as interpreted by Finest Kind, Roy Forbes, Mark Haines, Tom Leighton and Jan Andrews. Moxy Früvous took to the stage next for a lively 45-minute concert. The Saskatoon Moon session featured a double bill with Canadian folkies Connie Kaldor and Roy Forbes. Richard Knechtel hosted the Songs from the Heart session on the Red Stage. The participants, all SOCAN award winners, included Jennifer Noxon, Ellen Hamilton, Glen Reid, Michaela Foster Marsh and Holmes Hooke. Legendary guitar player David Essig hosted the I Love My Guitar session with Brandon Scott, Rick Fines, Andy Sheppard and Shelley Jennings. Talented Irish flute player Erin Cassidy performed tunes from her album The Wind at Play. Lizzie Shanks and Brandon Scott were joined by a few musical friends during theBesharah in Concert session. The On the Fiddle session showcased a diverse lineup of talent: Gaston Bernard, Jami Sieber, Mark Haines, Gary Weinger and Peter Jellard. Tom Leighton hosted the My Main Squeeze session, a rollicking roundup of accordionists Danielle Martineau, Bonnie Dawson and Benoit Bourque, and concertina player Ian Robb. The Green Stage opened the afternoon with It’s Only Rock & Roll, hosted by Roy Forbes and featuringTerry Tufts, Sherry Shute, David Essig and Fred Guignion. Local singer-songwriter Charlie Sohmer was up next with a 30-minute concert. The struggle against adversity was the theme in the Breaking Through session hosted by Sherry Shute and showcasing Ferron, Vance Gilbert, Bobby Watt and Deborah Herr-Allen. A 30-minute concert with Night Sun followed. Dance with Akpokli gave the audience an opportunity to sway to the rhythms of traditional drum music from Ghana. Gloria May Eshkibok hosted the Personal Politics session, a one-hour presentation of issues-oriented music with Bob Stark, Moxy Früvous and Nishtu. At the Point Stage, near the Ottawa River, Arthur McGregor hosted a Singalong Folk Jam with plenty of audience participation. Animator Erin Cassidy hosted the Learn to Play the Pennywhistle workshop. Just For Laughs featured the lighthearted music of Richard Knechtel, Vance Gilbert, Steve Fruitman and Robert Atyeo and was hosted by Ann Downey. Vance Gilbert in concert featured one of North America’s mostexciting folk performers. In the cool confines of the air-conditioned Inside Stage, the Black Sheep Salute was hosted by Paul Symes, the owner of the Wakefield, Quebec club. Mike Plume, Christine Graves, Oh Susanna and Kwasi Dunyowere the featured performers. A double bill followed with artists Terry Tufts and Erin Corday. Host Nancy Ziebarth joined forces with Cindy Thompson and Bourque, Bernard et Lepage for the Learn to Stepdanceworkshop. The second double bill of the day showcased the talents of Ana Coutinho and Lindy. The day ended with a dance featuring the music of the Mike Plume Band. The popular Family Area was a whirlwind of activity. Animator Judy Halla got things underway with Aerobics for Kids. Three separate Kindermusik sessions were animated by Claudia Mack, Kathy Ruggiero andMonica Wolf, who explored rhythms for the very young. Cindy Thompson was on hand to teach theStepdancing for Kids session. The Dickie Bird for Kids session featured Richard Knechtel, an entertaining and versatile folkie. Crafts for Kids, led by crafter Janet Whittam, gave family members a chance to make decorations. The evening performances on the Nortel Networks Stage kicked off with premier Ottawa Valley fiddler-stepdancer Cindy Thompson. The 25-member Sifa Choir was in the midst of performing when the skies darkened and the rain poured down in torrents, sending the audience running for cover. The storm abated within 20 minutes and the Sifa Choir returned to the stage, gamely performing without microphones. Their music lifted the spirits of the festival goers, who were delighted when the sun came out and a double rainbow appeared in the sky above the stage. Veteran folk festival performer Roy Forbes appeared in concert. Montreal singer-songwriter Danielle Martineau performed with the Stephen Barry Blues Band in a set that combined French-Canadian roots music, zydeco and reggae. Saskatchewan native Connie Kaldor performed her lyrical and humorous songs about life on the prairies. Following intermission, The Unceded Band featuring Gloria May Eshkibok, Miche Hill and Sherry Shuteperformed with their usual passion and playfulness. The band gets its name from one of the largest unceded Aboriginal territories in the world. Martin Sexton wowed the evening crowd with his evocative vocal style and original material. Ferron mesmerized everyone with her powerfully poetic self-penned songs. Much of her material was so well known that the audience sang along. After her performance Ferron was presented with theHelen Verger Award. Georgette Fry ably demonstrated why she was awarded Jazz Report Magazine’s Blues Artist of the Year award when she delivered a rousing closing set. Sunday morning and afternoon offered plenty of folk fun at Britannia Park. On the Nortel Stage, the day opened with Aengus Finnan in concert. Canadian Spaces Live, hosted by Chopper McKinnon, showcased the talents of Space Cadets David Essig, Bob Stark, Lonesome Paul and Crow’s Feet. A double bill followed featuring Martin Sexton and The Wyrd Sisters. 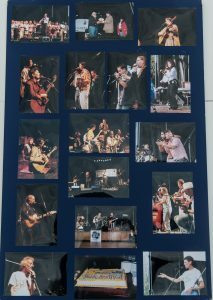 The Courriers in concert featured the legendary Ottawa folk group of the 1960s. Arlo Guthrie and Connie Kaldor were the dynamic duo who appeared in the Together Again for the First Time session. Heartland Live, hosted by Bill Stunt, recorded the performances by RobertAtyeo, Ana Coutinho, Crow’s Feet and Charlie Sohmer, which were later broadcast on Bill’s CBC Radioshow. First up on the Red Stage was the session Now That’s a Stretch with Ray Bonneville, Mark Haines, Tom Leighton and Deborah Kerr-Allen and was hosted by Lindy. Tall Tales and Strange Songs followed, featuring host Holmes Hooke and performers Robert Atyeo, Bobby Watt and Larry “The Bird” Mootham.Ron Moores hosted the That Good Old Time Music session with traditional songs by Lonesome Paul, Gail Gavan, and Bourque, Bernard et Lepage. A double bill with singer-songwriters Glen Reid and Gord Johnston followed. The Great Outdoors session hosted by Jan Andrews was a truly Canadian experience withBlackflies, Holmes Hooke, The Wyrd Sisters and Glen Reid. Alan Weekes hosted a rousing session ofAmerican Acoustic, honouring the CKCU-FM folk show of the same name. Musicians included Martin Sexton, Ann Downey, Vance Gilbert and Erin Corday. The Unceded Band set the pace with a concert on the Green Stage. This trio expresses in song the plight of indigenous peoples and other social issues. A little gospel music does a soul good on a Sunday morning. Neema Mugala hosted the Glory, Glory session, featuring songs of joyous celebration from the Sifa Choir, May Lebrun, Gord Johnson, Mark Haines and Tom Leighton. Montreal musician Elana Harte showed off her infectious rhythms and sparkling vocals in a 30-minute concert. The audience had the privilege of an intimate concert with Ferron. Lee Hayes was host of For the Love of Music session, an international collection of songs presented by Malaika, Vance Gilbert, Robert Atyeo, Crow’s Feet, and Bourque, Bernard et Lepage. The closing session was Dance with Dam’Deride, featuring the Montreal women’s choir directed by Danielle Martineau. Shelley Posen led the workshop titled Learn to Sing with Shape Notes on the scenic Point Stage. Larry “The Bird” Mootham and Southside Steve led the Learn to Play the Harmonica workshop. Vince Halfhide followed suit with Learn to Play the Slide Guitar, and was assisted by two masters of the form: David Essigand Rick Fines. Host Georgette Fry was accompanied by Ray Bonneville, Martin Sexton, Larry “The Bird”Mootham and The Mighty Popo in the Acoustic Blues session. The air-conditioned Inside Stage was a cool setting for the opening double bill with Rick Fines and Andy Sheppard. Rasputin’s owner Dean Verger hosted the Special Blend session, which featured Elana Harte, Lindy and Andy Sheppard. World music was the theme of See and Hear the World with Cheza, Gypsy Jive, M’El M’Rabet, Kebba Jobateh, The Mighty Popo, Ras Kagiso Mpala and host Stella Haybukhai. Erin Corday was the host of the I Still Love My Guitar, a roundup of several styles as demonstrated by TerryTufts, M’El M’Rabet, Ray Bonneville and Richard Knechtel. Dancing was definitely encouraged during theDance with Gypsy Jive session. The dancing continued with Dance with Cheza, a session driven by African rhythms. In the Family Area, Danielle Martineau hosted Accordion Tales, a roundup of styles of this sometimes misunderstood instrument. Judy Halla led the Aerobics for Kids. The Baobab Young Performers showcasedthe talents of a drum and dance society whose members range in age from 12 to 17. The group’s teacher, Kathy Armstrong, was on hand to show off her students. The Crafts for Kids workshops were hosted by Heather Boyd (jewellery) and Ted Kordner (drawing). The day ended with Dean Verger for Kids, where “Uncle Dean”told tales for the entire family. The evening entertainment on the Nortel Stage began with a lively set from Blackflies, a Cajun group that hails from Ontario. The Ottawa Folklore Centre Weekend Choir, directed by Andy Rush, promised to make the sun come peeking from behind the clouds and managed to accomplish this feat. This group had practiced throughout the weekend, and performed with panache. Popular Ottawa Valley singer Gail Gavan had a lively response from the audience, which welcomed her traditional songs and stories. Guitar wizard David Essig knew he was on the right track when he played “Sunrise II”, the theme song for Canadian Spaces. This song was the best received in his polished set. Bourque, Bernard et Lepage had fun singing and dancing their way into the hearts of the crowd. One audience-pleasing number saw Bourque stepdance and shave a volunteer from the audience. After the intermission, The Wyrd Sisters, a Winnipeg-based trio performed their eclectic brand of music. The much-anticipated set by Arlo Guthrie delighted the audience, who were thrilled to hear their favourite songsfrom the author of “Alice’s Restaurant”. The festival presented Arlo with an original painting by Roberta Huebener, as a thank you for the role he played in helping to save the festival, which nearly foundered in its third year. In 1996, Arlo performed in two sold-out benefit concerts that helped raise enough funds to put on the 1997 festival. The amazing African-inspired rhythms of Cheza were featured as the last act of the evening and brought to a close the fifth annual CKCU Ottawa Folk Festival at Britannia Park.